German pancakes are a wonderful way to start the day. They are so easy to make and fun to eat! I love that you can add whatever topping you like. 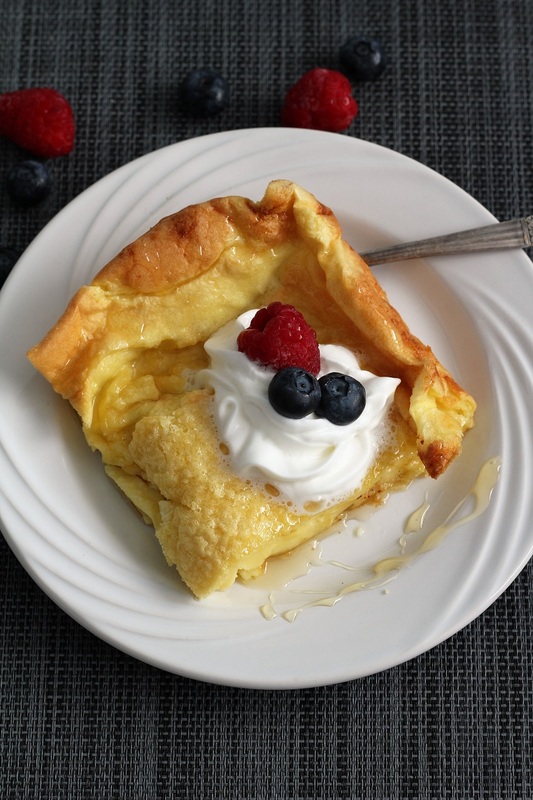 Try adding syrup, or even some delicious berries, and if you are feeling fancy, add some whipped cream! My daughter was asking me for some ideas for her son for scouts. They are putting together a scout cookbook and they needed some easy recipes. I suggested that she use German pancakes and so after awhile she texted me and asked me what they were called on the blog. I texted back and said “German pancakes are not on the blog, every time I make them, we eat them before I get a picture”. True story. And you know that sometimes even if I do take a picture, I end up not using them. Some pictures depending on the color and the shape or even the food just plain do not look as pretty as some. I do not know if you are like me but some of the food I make, may not look good, but it sure does taste good. I guess food is like a good book, you cannot judge it by it’s cover. It needs to be tasted before you just assume that it doesn’t taste good. 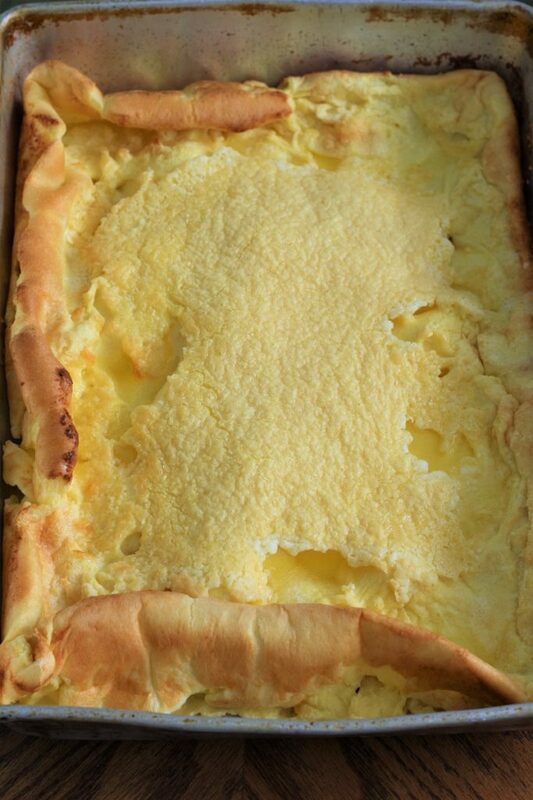 We have been making German pancakes forever, and my family loves them. So, when you make German pancakes, be sure not to worry, they do puff up and then when you get them out of the oven, they deflate and go flat! Ha ha!! Yep that is right, you are making them right, if that happens to your German pancakes. I like this recipe, because if you are trying to cut back on sugar, you can just add some fresh fruit. Most of my family loves to add maple syrup, and we make it from scratch. It is very easy and it is the only syrup that my kids will eat. Once in awhile we will go somewhere and have maple syrup from the store and my kids do no like it. It is very syrupy and just doesn’t have the wonderful taste that you get from making syrup from scratch. We also love buttermilk syrup, but it is sweeter than maple syrup, and so we do not make it very often. However if you want to make an impression, I would make the German pancakes and the buttermilk syrup. 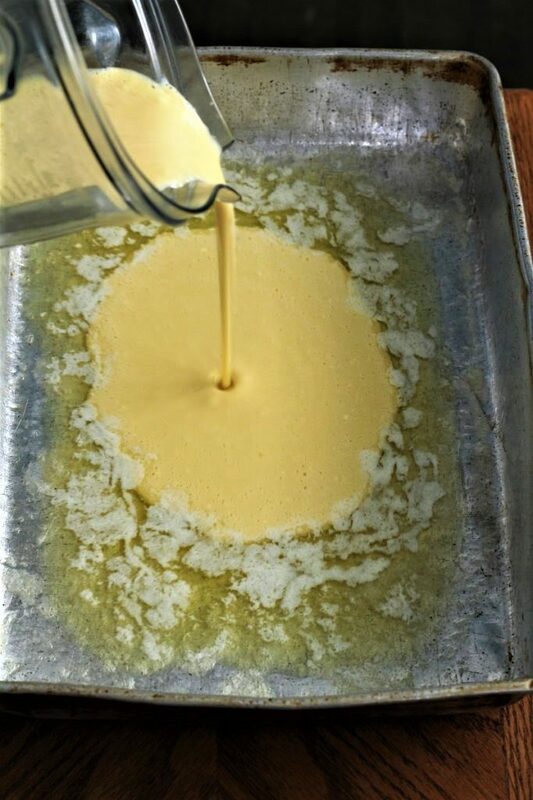 German pancakes made with buttermilk syrup would make a real treat for all of your loved ones or even once a year, my husband takes both of our syrups to work and they eat them on pancakes. Yes, they are that good. Perfect for special occasions. 1- If you like a lot of butter, you can add more butter to the bottom of the pan; up to 1/2 cup. I use less because that is what we like. 2- Make sure that you do not over mix your German pancakes after you add the flour, otherwise they tend to be heavy and not as fluffy. 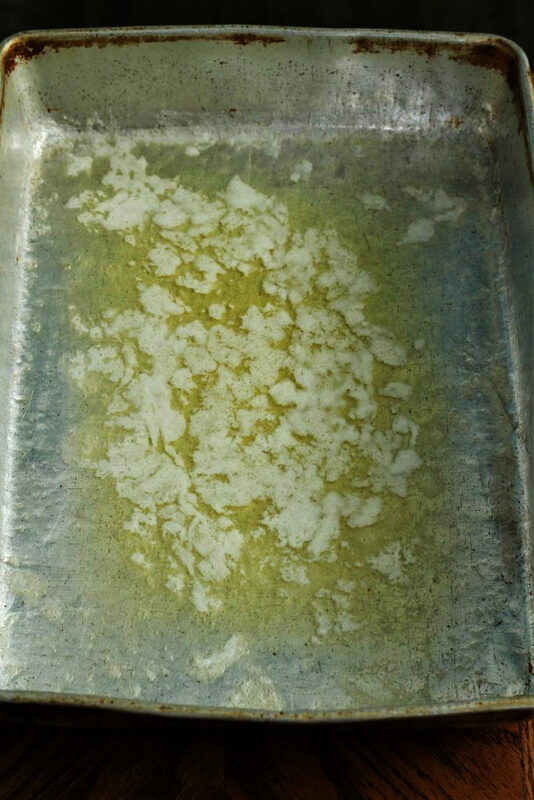 In a 9" x 13" pan, place the butter and put it in the oven, just until it is melted. In a blender, add eggs, milk, vanilla, and salt, mix just until blended. Then add the flour and blend only until the flour is mixed. Pour the mixture into the pan on top of the butter. Place it in the oven and cook for 20 minutes. They will puff up and when they are brown around the edges, they are done. 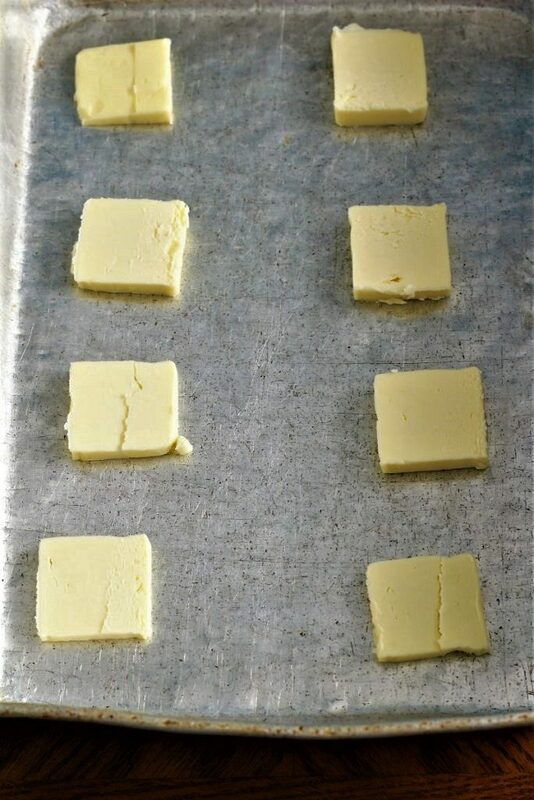 Remove from the oven and cut into 6 equal squares. (I use the pizza cutter). Add your favorite syrup, nut butters or even fresh fruit. Sounds great. I never realised pancakes around the world are all so different until recently. Here in the UK we make them similar to french crepes but not quite so thin, and we often have Scots Pancakes which are more like thick American pancakes. These german ones are new to me, I look forward to giving them a try. These look great and I think I’ll try making a batch this weekend. Funny part is, I am from the US, but we are currently living in Munich, Germany and I have NEVER had German pancakes. Now I am on a mission to make them at home and then go on a hunt to find them. Isn’t it interesting how sometimes it takes a little nudge of some kind to try something. Sometimes we are just unaware of things that are right there. I hope that you enjoy the German Pancakes. I love your website. I actually like decluttering, but I have family members who I need to get on board. You have some great ideas. Thanks! Maybe if you start your decluttering journey, your family will want to follow? On another note, we tried these pancakes this morning and they were amazing!! So simple and yummy. My daughter asked for a second helping. I’ll make sure I post a “tried it” on Pinterest so you can see how they turned out. How exciting that you tried them and that they turned out so well. I’ll have to check it out on Pinterest. Thank you. I’ve never had German pancakes before but I am pinning your recipe for later. Thanks for linking up with us at #OMHGWW! You are in for a real treat. Thank you for coming by and leaving a message. This sounds so easy!! I will have to make this for the boys! And the food photography struggle is REAL!! Some food just doesn’t photograph well. But these pictures look amazing! I hope that the boys love them. And sometimes the things that look the worst are really the best. Thank you for stopping by!